Cabot Guns is a niche manufacturer of firearms, lefties are a niche group of shooters – the pairing of the two individualities could not be more fortuitous. Your entire life, you’ve settled for the “right” way of doing things. At Cabot Guns, we settle for nothing. Let us introduce you to the “left” way of doing things, let us introduce you to the S100 South Paw – a dedicated left-handed 1911 pistol. To simply state that Cabot’s S100 South Paw 1911 is a “lefty 1911” would be akin to calling the 1911 “just a pistol.” Cabot engineers tackled the issue of developing a true left-handed firearm at the design level, re-engineered John Browning’s design as if it had been originally intended as a left-handed pistol, then plied our trademark precision-obsessed manufacturing process in creating the industry’s only left-handed 1911 style pistol. Cabot engineers went about rebuilding the classic 1911 as if it had been designed for lefties from the ground up and constructed it from a block of steel. Where the current industry tackles the issue of creating a pistol for South Paw’s with terms such as “ambidextrous safety,” and “reversible magazine release,” Cabot went one further – and then some. We inverted John Moses Browning’s 1911 design perfectly. Everything, has been mirrored and tailored for use specifically by those of the left-handed-persuasion which not only includes a left side ejection port but all small controls: left-hand thumb safety, left-hand slide stop and an inverted magazine release. With precision expected from a Cabot pistol the South Paw comes with an accuracy guarantee of 1.5 inch groupings at 25-yards right out of the box. In accordance with our commitment to excellence, innovation, and the shooting culture, we’ve graced the slide of our South Paw with our innovative reverse dovetail front sight which provides the advantage of a no drift front sight with superior structural integrity. 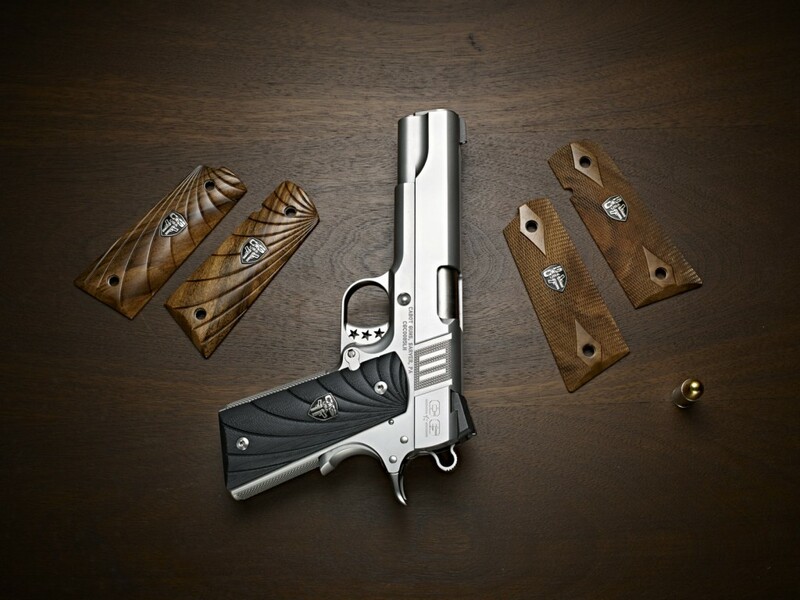 Available with white-dot, tritium or gold dot accents, this sight is dovetailed from the front of the slide; rather than being staked from the top as in standard designs. For the shooter this means a seamless transition between slide and sight, a clean slide and Cabot’s obsessive precision incorporated even into this, the smallest of details. 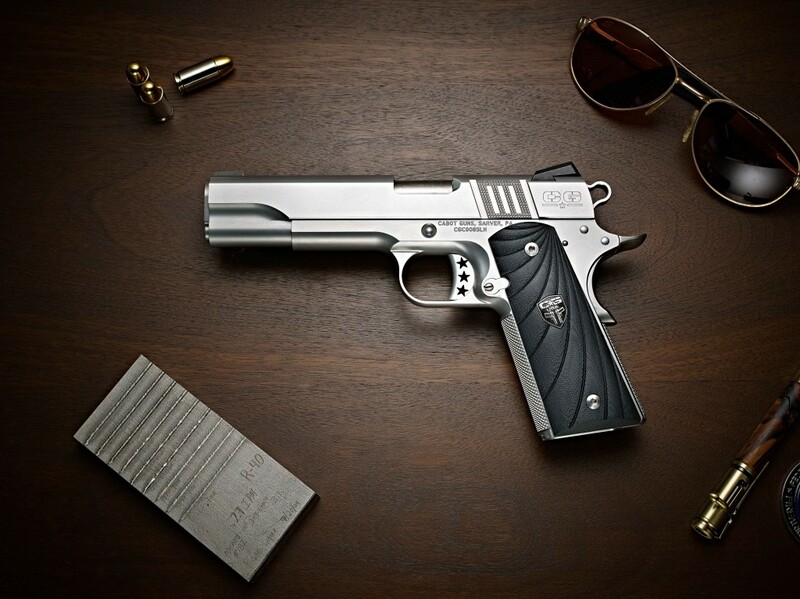 The precision details and innovation do not stop there; in addition to offering all standard stainless steel construction, the pistol is also available in an optional DLC finish over stainless steel – a durable and unique touch for those who prefer a black pistol and ensures the pistol you carry holds up to the life you live and survives the adventures you seek. No longer is a left-handed shooter forced to settle for a right-handed pistol with ambidextrous controls; instead, we’ve created a 1911 that’s all your own. Stop thinking about it, you already know that this is the pistol your shooting hobby deserves; you’ve earned the right to a pistol as individually perfect as you are, bring home your S100 South Paw and become a part of the Cabot Guns family. Interested in a carry size left-handed 1911? Check out our S103 Southpaw. Weight (full magazine): 45.9 Oz.